Who stood out to you on last nights red carpet? What trends did you notice? Undone updo’s- last nights “do’s” were far from finished and polished. Teased and loosely pinned, simple and borderline “bed head chic”. Even smoothed locks included obvious fly aways regardless of HD coverage. Refreshing to the average girl, and attainable by the most novice styler. Slick, straight hair. A style not easily pulled off but sported by Hayden Panettiere and Kelly Osbourne. Short cuts! Obsessed-nothing showcases a woman’s face like a great cut like these ladies! 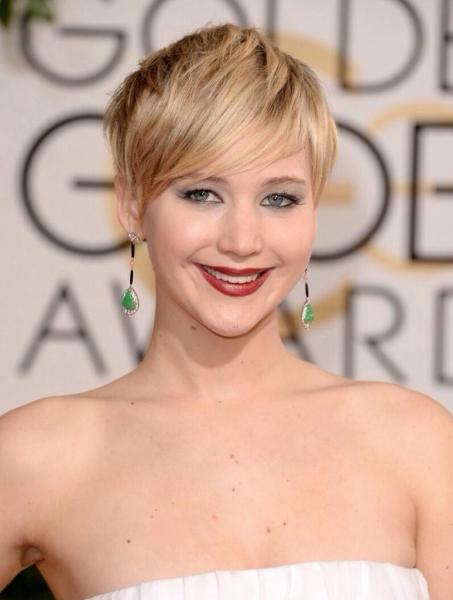 My stand out star of 2014 Golden Globe Awards is…..Drum roll please….. This ladies & gents is how I envision Hollywood Glamour ! She was dazzling in her white Gucci Dress, side swept hair and simple make up. She is officially on the top of my “who to watch for in 2014” list! FLAWLESS! Anyone else excited to see how last night’s red carpet forecasts how the Grammys & Oscars will look?